These special sight gauges, marked off in ounce graduations, are placed alongside liquor and wine bottles so managers can perform consistently accurate inventories. Graduations are also marked on each gauge in milliliters, typically for use outside the USA. The Shot Glance gauges are made of durable plastic which is perfect for a wet bar environment. 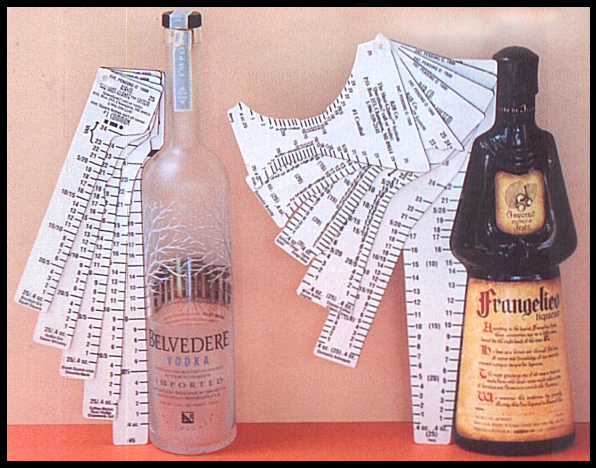 Orders come with 24 Shot Glance gauges to measure EVERY liquor brand of 750 ml and liter bottles, even the odd-shaped bottles. At only $149.95, we are the lowest Shot Glance price on the internet. For only an additional $50, if you purchase the Shot Glance gauges, we'll email you a software program that contains a series of 5 easy-to-use Excel spreadsheets for inventorying Liquor, Wine, Bottled Beer, Draft Beer and Miscellaneous Items. Managers simply enter inventory data into the spreadsheets and the software automatically calculates inventory values, potential revenues and beverage cost percentages. These calculations help managers verify that depleted inventories have been rung up properly as sales. Just choose the 'Shot Glance Gauges & Software' option when placing your order. Some other inventory gauge options are available by clicking on the 'Related Items' tab where you will find a Speed Gauge that will fit 90% of the straight-sided liter bottles and also a 1.75L gauge that fits most of the big 1.75 liter bottles. To Our Canadian Friends: We are sorry to report that there are no gauges for the 40 oz. bottles. Click on this link to download a PDF version of the Shot Glance Instructions. Click on this link to download a PDF version of the Shot Glance Gauge Chart. The Speed Inventory Gauge is the perfect tool to help managers quickly inventory straight-sided liter bottles. Simply hold the gauge up against the bottle and follow the liquor level across to the gauge to determine how many ounces are left in the bottle. The 1.75L Inventory Gauge is designed to help managers obtain quick inventories from the big 1.75 liter bottles. Simply hold the gauge up against the bottle and follow the liquor level across to the gauge to determine how many ounces are left in the bottle. Click on the link for more information.